This is the second time I painted this sweet cat from the shelter, the first time was here. This afternoon my husband and I picked up 118 pounds of "Glass Beach Blend Amalfi" tiles for the kitchen. 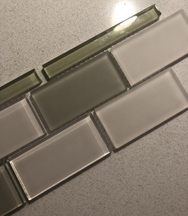 They are subway tiles with a mix of shiny and frosted tiles in white and grayish green and will be accented with a narrow runner of more saturated green glass tile. Still waffling on grout color, but psyched to see them installed! Pictures soon. OK, I'm loving the painting but I'm squirreling the info on the tile away for the house Jim and I will be building next year. Perfect! Love the limited color palette. 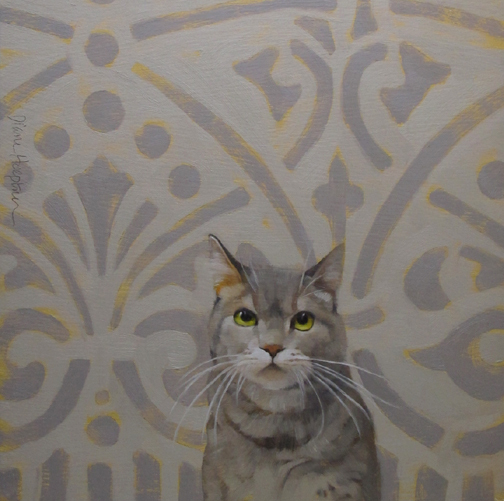 The cat's presence is enlarged by the simpleness of the painting. Just great! Cannot wait to see your new kitchen!